Being with Bayanihan is not an easy decision, it is not an easy task. But Bayanihan work is fulfilling and inspiring. So as long as Bayanihan is asked to do these social services and as long as she is needed to do so, Bayanihan is here to stay and so are the committed Bayanihan women. Diana Oosterbeek-Latoza is one of the founders of Bayanihan. She was the first chairperson of Bayanihan and has been actively involved with Bayanihan since it was founded in 1991. Diana believes that Stichting Bayanihan has a social commitment to enhance and develop the integration and participation of the Filipino women through empowerment in the Dutch society. Her functions have been multiple: coordinator, opvang medewerker, programme officer, project manager, and social cultural worker. She is a native of Iloilo City, Philippines and was an English instructor in the University of Iloilo and the Iloilo School of Art & Trades (now Western Visayas College of Science & Technology) in the years 1966-1976. She has lived and worked for a year in Southern California, USA. In 2007, she won the ZAMI award prize. ZAMI Award is a yearly prestigious prize wherein the strength, dedication, quality and uniqueness of black, migrant and refugee women are recognized and honored. Emphasis is given on the distinguishing contribution of these women within the Dutch society and most especially their outstanding influence in the empowerment and participation of women groups and other black, migrant and refugee women. Diana is at present working as volunteer coordinator, social cultural worker and board member of Stichting Bayanihan. She received her Bachelor of Social Work degree last August 2011 from the Instituut voor Social Work/De Horst of the Faculty of Society & Law of Hogeschool Utrecht, University of Applied Sciences Utrecht last August 2011. I have witnessed the work of Bayanihan since I started attending the information days and trainings. My belief in Bayanihan’s mission & vision grows as I get deeply involved in its work. Bayanihan has helped me develop the skills, cultivate the talent I have, and help me focus on something worthy: the needs of our co-Filipinas and the ability to do something about it. Empowering the Filipinas by integration, emancipation and participation in the Dutch society is a difficult job, and yet it is fascinating and challenging. Rendering social service to our fellow Filipinas for several years now has given me a sense of fulfilment and belonging. I’m proud to say, I now belong to Bayanihan and own its vision and mission. Rose Slotema-Haboc holds degrees in Zoology and Physical Therapy and comes from Sorsogon City, Philippines. She works part-time in the administrative sector of the research department of The Erasmus Medical Center in Rotterdam. Since October 2007 Rose has been a full-pledged volunteer for Bayanihan as “vertrouwenspersoon” in the social service. She became a board member in 2008, later secretary of the Board of Bayanihan in 2009 and in 2010 she became treasurer of the Board. Coming to the Netherlands is an entirely new beginning for me, and joining Stichting Bayanihan is one of the exciting steps I’ve made to get started. Bayanihan enables me to meet genuinely true people and keeps me well-informed of the challenges and opportunities that Filipinas face in the country. It’s an honor to be a part of the working board. When Myra arrived in the Netherlands in the end of 2012, she was keen in looking for Filipino organizations to grow with. 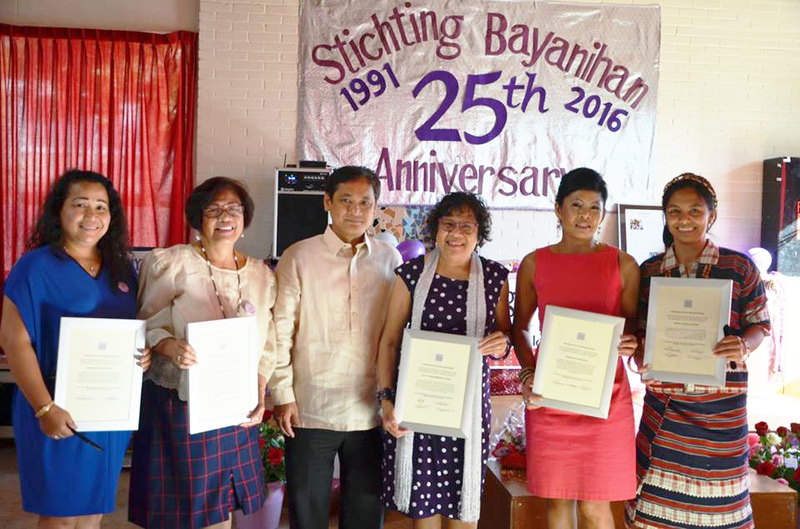 Stichting Bayanihan’s work of empowering Filipinas in the Netherlands inspired her the most. Beginning November 2013, she started joining Bayanihan’s activities and participated as one of the panel guests at the International Women’s Day celebration in March 2014. By mid 2014, she joined the working board as secretary, helping with events, documentation and management of social media alongside other digital deliverables to help keep Bayanihan up to date with recent technological developments. Prior to moving to the Netherlands, Myra worked with small and medium-sized enterprises (SMEs) in the healthcare and academic sectors in China and in the Philippines for about 10 years, primarily in the marketing and communications divisions. She is a professional content manager, writer, editor, journalist, teacher, and event organizer. She holds a Bachelor of Arts in Mass Communication degree from Saint Louis University in the Philippines and a Master of Business Administration certificate from Shanghai Jiao Tong University in China. Myra has constantly been keeping herself updated with recent developments in media and business by taking short courses & trainings online or offline, the most recent of which, include Business Process Management from the HU University of Applied Sciences in Utrecht. She now finds a new home in the Netherlands, blessed with a beautiful son, a loving husband, and her own business initiative, E3 Data Intelligence Services. By supporting each other, we stay strong. Through my voluntary work for Stichting Bayanihan, I feel more connected with my roots, with my fellow Filipina women and with the Filipino community in the Netherlands. It gives me much joy and fulfillment to be of service and give assistance in any way I can, to those who are in need. Veronica Balbuena has been involved with Stichting Bayanihan from the moment it was established in the 1990’s. She was actively involved as one of the pioneer volunteers in social service from 1991 to 2000. In 2007, she returned to an active role in Stichting Bayanihan by rendering her financial expertise. Veronica originally comes from Mabinay, Negros Oriental, Philippines. In 2009, Veronica served as the Treasurer of the Board of Stichting Bayanihan and a year later, from September 2010, she became the Chairperson of the Board. At present, she continues to serve in her function as Member of the Board. With her years of experience as a Business Administrative Accountant and currently working as Supervisor General Accounting at Technip in The Netherlands, Veronica has gained professionalism in dealing with Dutch institutions and she has also gained a strong foothold in the Dutch society. Being a mother of two children, Veronica has learned to divide her time wisely between her professional career, her family and her time for Stichting Bayanihan. She strongly believes in the mission and vision of Stichting Bayanihan and seeks to be of significance in Stichting Bayanihan’s social commitment to help and assist Filipinas in the Netherlands towards self-development, empowerment and emancipation. I went back to the Philippines in 2010, and I miss my work at Bayanihan that I also did social work in the Philippines with Filipinas who have problems. But Bayanihan is different and I miss my colleagues. I resigned that time as a board member but not as a volunteer. But being a volunteer is not the same as being a member of the board. Cora van Camperhout-Alarcon is one of the pioneering members and also board members of Bayanihan. She is also currently the coordinator of the Bayanihan Seniors Group.